We will refund you the difference plus an extra 5% discount off your stay. Contact us on 0203 475 4756. - If you find the exact same product (same dates, same residence, same type of accommodation, same reservation conditions) on sale elsewhere cheaper than we offer, we will refund you the difference. -	To qualify for this reimbursement, the offer price seen elsewhere must be recorded at the same time as booking with us, and you must send us proof of the price seen elsewhere (screenshot or scanned document). -	Offer only available on destinations directly managed by Madame Vacances (Only establishment, no additional extras). - A vast, lush green area to explore, with stunningly clear views. - Good value accommodation with plenty of choice. - A fantastic range of activities, from fishing to canyoning in the river rapids. 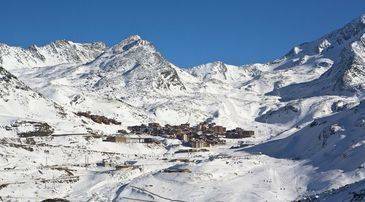 Spread across 10 mountainous villages, La Plagne is a huge, high-altitude resort located in the French Alps. Each of the villages in this picturesque resort - six of which are purpose built - has its own unique atmosphere and charm, and all are connected via a convenient free shuttle bus service. Part of the larger Paradiski area, a visit to this part of the French Alps during the summer offers a great blend of outdoor adventure and scenic relaxation. Both of our La Plagne properties enjoy peaceful settings away from the two largest and most popular towns, La Plagne Centre and Belle Plagne. 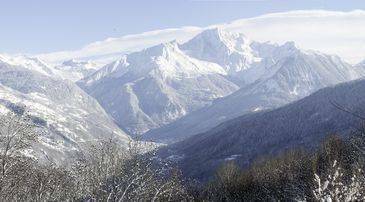 The quiet villages of La Plagne Soleil and La Plagne 1800, where our properties can be found, are both perfect options for mountain holidays, and are just a short bus journey from the main tourist spot of La Plagne Centre. Located in the Tarentaise Valley in the heart of the Alps Mountains of France’s Savoy region, La Plagne is a hugely popular resort. There is an incredible selection of amenities on offer here, including bars, shops and restaurants which will keep families, couples, solos and groups of friends entertained throughout their stay. These facilities are all easy to access from Madame Vacances’ properties, ideal for those wanting to enjoy a range of activities during a relaxing holiday. There is much more than to do in La Plagne than simply skiing. Keen explorers can get to know this stunning resort in the summer months by visiting the Grotte des Glaces. These caves spend half the year covered with glittering ice and in the summer months they come alive with colourful wildlife, including iguanas, marmots, birds of prey and flowers. Sports enthusiasts are encouraged to enjoy activities such as archery and golf, and other thrilling ways to explore La Plagne include enjoying the scenic views from up high by paragliding or on the high cable run. Hiking is popular in this resort all summer long thanks to the vast stretches of idyllic scenery and the flora and fauna which can be found here. If you’re looking for a leisurely stroll, take a walk through the footpaths of the Bief Boffet, Les Mairiers, and the Cavard Walk. For something slightly more challenging take a guided hike through the rugged mountainside of the Grande Plagne or even a horseback ride around Dou du Praz; a pretty, sloped area of the mountain. Another exciting way to make the most of the rolling green landscape of the area is to try your hand at cliff climbing. There are climbing opportunities for both children and grown-ups, with self-sufficient and assisted options available for all levels. During the summer months, this sun soaked resort in the valley of the Isere River becomes a haven for water activities. Canoeing and kayaking are particularly popular in the wild waters of the area, along with canyoning in rapids and mountain streams. Vanoise National Park is a great spot for fishing, and first timers and seasoned experts alike can enjoy fishing for arctic chars and rainbow trout in this spot of natural beauty. After a day out in the sunny French mountains, a great way to unwind and pamper yourself from head to toe is with a visit to one of the spa and wellness centres of the resort. Spas such as Spa Bellecote, Espace Paradisio, and Club Alpina all offer incredibly luxurious treatments which will leave you feeling thoroughly rejuvenated after a long, active day. Services and facilities on offer include saunas, steam rooms, ice baths, relaxing massages and beauty therapies. The resort also features bowling alleys and games rooms where the entire family can have fun together. There is also a carousel to keep very small children entertained and an indoor climbing wall. When the kids just want to sit down and put their feet up, the family can pay a visit to the La Plagne’s spacious cinema, with some English speaking films shown here. The French Alps are renowned for their long history of culinary creation. The gastronomy of La Plagne is no exception, and here you will find a selection of alpine eateries serving the very finest dishes with fresh ingredients taken straight from the mountains. If you would like to taste the traditional cuisine of the region then head to rustic restaurants such as L’Arlequin and Au Bon Vieux Temps in Plagne Aime 2000. For something closer to home, pay a visit to cosy bistros close to your Madame Vacances property like Le Loup Blanc and La Cantine in Plagne 1800 or Le Baryon in the village of Soleil. It’s not just rugged mountain restaurants on offer in La Plagne. Here you will also find first class French haute cuisine; perfect for a romantic evening or as a way to start off a lavish night out. These glamorous restaurants, including Carlina and family run Les Verdons Sud, can be found both in the heart of the resort and slightly further out on the mountain slopes. If you’re travelling with the whole family then you might like something slightly more international and budget friendly. There are plenty of cafés located close to the slopes of La Plagne where you can pick up a burger and chips or simply a slice of pizza for an affordable price. There are also some great nightlife options in La Plagne, especially après-parties which remain open throughout the year. Nightclubs in the resort such as La Mine Bar in Plagne 1800 come with outdoor terraces, live DJs playing great music, and a lively atmosphere which lasts well into the night. There are also more relaxed options for nightlife, including English style pubs and classic après-ski bars. All of the lifts which stay open through the summer can be accessed with one pass. This pass can be purchased from Plagne Bellcotte, which is open from Monday to Friday and Sunday from 9am to 4.15pm. Passes are available for mountain bikers and pedestrians (children’s passes are free) and provide permission to ride the Montchavin, Champagny, Fornelet, and Roche chairlifts as well as the Roche de Mio cable car. La Plagne resort has well trained staff dedicated to taking care of children working all through the summer season. Crèches and childminding services with English speaking staff are available for children up to three years old with Alpine Childcare and Safe Hands France. Children aged three to 12 can spend the day at kids’ clubs at the resort, which provide fun and games as well as educational and sporting activities. It is easy to find space for car parking in La Plagne during summer. Free parking can be found at the Funiplagne Grande Rochette in La Plagne and by the tarmac parking area by the Montalbert chair lift. It is also possible to pay for indoor or covered parking at spaces all over the town of La Plagne.